While the notion of refugees typically brings to mind forced migrants living in camps or certain neighborhoods designated by the receiving government, the situation in Turkey is quite different in that urban refugees predominate. Turkey had granted temporary protection status to more than 3.1 million Syrians as of July 2017—all arriving since April 2011. Fewer than 8 percent (about 235,000) live in camps, while the rest are scattered across the country, mostly in urban centers, living side-by-side with the local population. Istanbul, home to more than 522,000 registered Syrian refugees, is the Turkish province with the largest number of refugees. The emergence of these urban refugees has important implications for local governments, especially municipalities, which have taken on the direct work of caring for this vulnerable population. These newcomers arrive with a number of humanitarian and economic needs, ranging from housing and education to language support, and their sheer numbers in some cities have caused tensions with the local populace. Even as municipal governments must meet many refugee service needs, they occupy an ill-defined position with respect to their legal mandate and political authority vis-à-vis the refugees, and are also severely underfunded and understaffed. This article is adapted from a study led by the Marmara Municipalities Union Migration Policies Workshop (Marmara Belediyeler Birliği Göç Politikaları Atölyesi, or MAGA) and conducted by a team under the direction of the author from March to November 2016. The research aimed at understanding how local governments managed the process of vast numbers of refugees settling in their districts regarding the additional burden on the resources and services as well as the humanitarian needs and demands of the mostly poverty-stricken refugees. Based on the study findings, this article offers an overview of how 39 local governments in Istanbul province managed the vast numbers of refugees settling in their districts in terms of the additional burden on resources and services. It also examines the humanitarian needs and demands of the largely poverty-stricken arrivals. Thus far, cities have managed the process very successfully despite lack of clear authority and resources. Still, they run the risk of legal consequences and social tension in providing services to refugees and foreigners because municipalities under Turkish law and regulations can normally only serve Turkish citizens. While Turkey has long been a country of emigration and to some extent of immigration, the scale of the recent Syrian refugee inflows is unprecedented in Turkish history. The uprising that began against the Syrian regime in March 2011 spiraled into a still-raging civil war. As of June 2017, at least 5.1 million Syrians had fled to neighboring countries and another 1 million or so had gone to Europe, the United States, or Canada. Within Syria, 6.5 million are internally displaced. The movement of Syrians across the 566-mile border into Turkey began with a group of 252 people on April 29, 2011, and has continued uninterrupted in the subsequent six years. Turkey’s “open-door policy,” which is fully compatible with international protection principles, has been maintained since the Syrian flows first began, even as some difficulties have occasionally arisen due to safety concerns. Turkey alone hosted 52 percent of all Syrian refugees as of July 2017 (see Figure 1). Still, with Turkey’s overall population at around 80 million, its 4 percent refugee share pales in comparison to that for other top hosts of Syrian refugees. In Lebanon and Jordan, refugees are around 17 percent and 8 percent of overall residents, respectively. Note: European Union numbers include asylum seekers in EU Member States, as well as in European Free Trade Association Member States Norway and Switzerland. Sources: Turkish Ministry of Interior, Directorate General of Migration Management (DGMM), “International Protection Statistics,” updated July 27, 2017, available online (in Turkish); and UN High Commissioner for Refugees (UNHCR), “Syria Regional Refugee Response,” accessed August 8, 2017, available online. Because Turkey reserves formal refugee designation only for those fleeing as a consequence of events in Europe, the overwhelming majority of the more than 3.1 million Syrians in Turkey hold temporary protection (TP) status. Currently about 82,000 Syrians in Turkey are “preregistered” and are awaiting approval for TP status, a process that involves security checks. Beyond Syrians, Turkey since 2011 has accepted 850,000 to 900,000 refugees from other countries, primarily Afghanistan, Iraq, Iran, and Pakistan. Approximately 500,000 of these have since moved onward to Europe. The first Syrians who came to Turkey were placed in 26 accommodation centers, built according to the highest standards and in very little time. However, as the influx continued ceaselessly, many new arrivals started to live outside of the camps, spreading to every region of the country. Eventually the numbers in urban or other settings exceeded those living in the camps. As of July 2017, around 235,000 Syrians, just 7.4 percent of the total, lived in 23 refugee camps (three camps were closed) in ten provinces. The remaining 92.6 percent lived as urban refugees, and can be found in all 81 provinces. This urban share is far higher than seen globally, with about 60 percent of all refugees worldwide living in urban locations, according to the UN High Commissioner for Refugees. Turkey has not arranged any formal placement for the Syrian arrivals, as they are considered to be temporary. As a result, most are scattered according to their own will. Source: Turkish Ministry of Interior, DGMM, “International Protection Statistics,” accessed August 8, 2017, available online. More than 75 percent of the Syrians in Turkey are children and women in need of special protection; 44 percent are children under the age of 18. Indeed, more than 12 percent of those with TP status in July 2017 were children ages 4 and under. Between May 2011 and May 2017, more than 224,000 babies were born in Turkey to displaced Syrians. For the time being, most of these children are stateless, as they are neither granted Turkish nor Syrian citizenship at birth. Education of children will be one of the major items on the integration agenda, with the near-term prospects for return to Syria incredibly bleak. There are more than 967,000 school-aged Syrian children in Turkey, of whom 492,000 (50.8 percent) are receiving education, despite the language barrier and limited capacity of schools. This number is expected to reach 650,000 (65 percent) in the 2017-18 academic year. Projections show that at least 40,000 to 45,000 additional teachers and 30,000 classrooms are needed in order to integrate 80 percent of Syrian children into the Turkish education system. The annual cost of these new teachers alone would be more than 550 million euros (US $627 million) per year. Beyond financial constraints, other concerns include maintaining the quality of the Turkish education system and avoiding social tension. Undoubtedly, getting nearly half a million children into schools at all is itself a major achievement. But 60 percent of these students are being taught in Arabic, under a Syrian curriculum, in “temporary education centers.” The quality of this education is questionable, and is not optimal for the integration of students into Turkish society. Further, more than 450,000 children have not been in a classroom since 2011, potentially representing a lost generation. Fully integrating both groups into the Turkish education system could reduce some of this loss, though not without financial and social strain on the system. Istanbul, home to around 18 percent of Turkey’s population, is the biggest province. Unsurprisingly, the greatest number of international migrants and refugees, Syrian and otherwise, also live in this metropolis. Around 1 million registered foreigners live in Istanbul (others who are registered elsewhere or remain unregistered also live there). Included in the registered foreigner numbers are at least 520,000 Syrians under temporary protection—between 17 and 20 percent of all Syrians with this status in the country. Source: Istanbul Metropolitan Municipality (IMM) Directorate of Urban Planning, unpublished document provided to the author. Although there are some exceptions, the locations where Syrian refugees settle generally have a number of things in common: Widespread poverty, high levels of cultural conservatism and religiosity, a strong sense of community solidarity, and low costs of living. According to the results of a quality of life study carried out by the Istanbul Metropolitan Municipality (IMM) in 39 districts, refugees cluster in districts that are generally seen as disadvantaged. Turks in these districts perceive refugees more positively. This can be interpreted both as a sign of emotional solidarity and of the ability of refugees to adapt to these regions more easily, due to lower cost of living and conservative community structure. There is much uncertainty regarding the legal basis for local governments in general, and municipalities in particular, to act on refugee issues. The main legal sources at the national level in Turkey in this regard are Municipal Law No. 5393 and the Law on Foreigners and International Protection No. 6458, the latter implemented in 2014. Municipal Law No. 5393 states that services are to be given to “citizens.” However, the law’s exact definition of who constitutes a citizen and whether those without Turkish citizenship may be eligible for municipal services is unclear. In addition to these, city councils and voluntary service agencies also address foreigner issues from time to time. Further, Article 96 of the Law on Foreigners and International Protection, which establishes a national framework to ensure similar treatment for refugees, gives local governments a very limited role in this area. Municipalities are expected to work through the national government’s Directorate General of Migration Management and benefit from the suggestions and contributions of other organizations including the local governments. In other words, the law states no role for the municipalities, without a clearly defined mandate or authority regarding refugees and other foreigners. Urban refugees pose many significant challenges for the municipalities where they live. Due to the lack of a national strategy concerning the role of local governments and the aforementioned ambiguities in the law, municipalities face these challenges in various ways. The main focus of this study was to understand the dynamics and determinants of successful initiatives created by Istanbul municipalities. A comprehensive work on local governments and refugees, the research took place in Istanbul Metropolitan Municipality (IMM) and 39 district municipalities in the province. Primary data were collected through in-depth interviews with 52 relevant officials, mainly mayors, deputies, and department heads responsible for migration issues, from IMM and 27 district municipalities on both the European and Anatolian sides of Istanbul. Representatives of municipalities with fewer than 1,000 refugees provided their views via written response. Unsurprisingly, the size of the refugee population living in the district represents the main driving force behind municipal initiatives. Because municipalities lack easy access to reliable data on refugees in their territories, they have been working to create their own databases. The study team found a need to create a coordinated Istanbul-wide database, possibly under IMM, to provide more effective management and prevent abuse. Almost every municipal authority official interviewed suggested that a refugee needs analysis should be mapped by the Social Assistance Information System (SOYBIS), a monitoring tool used by Ministry of Family and Social Policies. In order to skirt legal and administrative restrictions, teams aiming to serve refugees do so in a way that is considered “providing assistance to poor/those who are destitute,” based on the fellow-citizenship law. While some municipal officials maintained their actions are completely in line with the law, others said they provide services at a risk and despite legislative barriers. Delivery of services through nongovernmental organizations (NGOs) is also a common strategy to overcome legal restrictions and make use of charitable donations. Municipal services for refugees dramatically differ from district to district. Some consciously avoid providing services, fearing this would incentivize more Syrians to move there. Others offer housing and guidance services while providing basic necessities and supplies. Some refugees have also received psychosocial support, and services for disadvantaged groups such as unaccompanied children, elders, school-aged children, victims of violence, and the disabled or chronically ill are becoming more and more systematic. Municipalities primarily seek to provide services to Syrian refugees where they live. In addition, refugee support is provided at municipal cultural centers, soup kitchens, municipal buildings, social markets, and neighborhood municipalities. Desks at the entrance of centers known as Beyaz Masa are tasked with addressing complaints and needs of refugees and local residents. Local officials interviewed for the study said lack of financial resources to adequately address refugee needs was a major concern. There are two sources of income for municipalities: self-generated income and transfers from general budget tax revenues. The latter, distributed according to district population size, is the major source of income. Because refugees and foreigners are not counted in this population, the issue of spending these funds on refugees becomes problematic. District municipalities provide special services for refugee health and education needs, which further constrains their already restricted resources. At the regional and local level, refugees tend to settle in poorer areas, partly as a result of the idea that “the poor help the poor.” However, this trend can have adverse effects for the already disadvantaged populations who live there. In areas with many refugees, local residents frequently complain that they cannot use public services such as health, education, and parks because of the refugees, which could lead to future problems. Municipalities are sensitive to the concerns of the public and, as they are also political entities, strive to avoid negative reactions. In reality, disruptions in local services happen on a relatively small scale. Turkish language instruction for refugee adults and public school enrollment for school-age Syrian children are two practices considered effective for integration, in light of significant language barriers between Syrians and the wider Turkish population. Almost all of the municipalities surveyed expressed the need for foreign language-speaking staff. 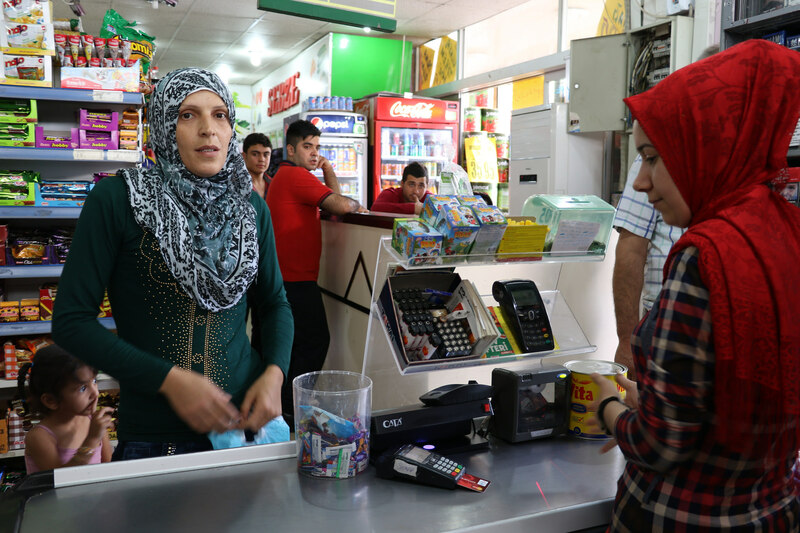 While accurate information is hard to obtain concerning employment patterns of Syrians, it was repeatedly mentioned that they are either working in low-skilled jobs—often informally and for little pay—or have opened their own small businesses. In a significant development, a new law in January 2016 introduced work permits for Syrians under temporary protection. Nevertheless, because of the high unemployment rate in Turkey, low qualifications and the language barrier, as well as the required minimum wage employers must pay, the number of Syrians officially employed did not increase after the law’s passage and remained around 10,000. Meanwhile, it is estimated that at least 500,000 Syrians work informally in Turkey. Syrian beggars are the subject of the vast majority of complaints made to refugee-related hotlines, representing a recurring issue in most municipalities. The sight of Syrian children begging on the streets of Istanbul, usually near traffic lights and in parks and other crowded areas, leads to the false perception that Syrians do not support themselves. While municipalities have been working to combat the stereotype, it is important to fight the actual problem as well as the perception, for instance by getting children off the streets and into schools. Municipalities appear to be hesitant to embrace concepts of immigrant integration or assimilation, avoiding topics that seem to imply these recent arrivals will remain permanently. For that reason Turkish politicians prefer to use the term “harmonization” instead of integration, though they have the same meaning in practice. However, an increasing number of programs are being devised and implemented by municipalities to integrate Syrians more fully into Turkish life. In regions with high concentration of refugees community centers established by the Ministry of Family and Social Policies, Red Crescent, other NGOs, or the municipalities themselves, work to inform refugees, provide them with training and education, assist with problems, and conduct harmonization-oriented programs. The plan is for these centers, currently numbering around 60 across Turkey, to come under Red Crescent supervision in the future. When asked about the future of Syrians and whether they were here temporarily or permanently, almost all of the 52 interviewees stated they believe the Syrians are here to stay permanently. Regarding their impressions of social acceptance and tension, the respondents stated that despite some community-level concerns, these anxieties and worries have not led to conflicts, and that both local residents and Syrians have been very careful in this respect. Many expressed the opinion that harmonization programs for refugees should continue and municipalities should take serious initiative, while including refugees in the process. The approaches and practices of municipalities, particularly in key refugee destinations, in handling Turkey’s largest mass migration in history are critical in defining how the country as a whole copes with an influx that has strained public budgets and resources. The author’s research, the most comprehensive study on local governments and refugees in Turkey to date, has uncovered a number of challenges and areas for improvement. Budgetary limitations are among the most pressing, and more refugees might be adequately served if national funds were provided to municipalities based on the number of refugees hosted. Lack of coordination among local governments, and between local and national institutions, is another obstacle to delivering services effectively, as is the absence of a shared data system to map refugee populations and needs. As the war in Syria drags on and the refugee population becomes more settled, municipal governments might consider implementing policies aimed at the short-, medium-, and long term. Maintaining the highly fragile social acceptance for these newcomers among the native population will be crucial, as concerns over refugees’ use of public services, safety threats, and job competition could create public-relations rifts that undermine the delicate balance if not handled carefully. Despite their limited legal authority, financial support, and capacity, Turkish municipalities have made great effort in accommodating refugees. The fragile but high level of social acceptance in Turkey from the outset, as well as involvement of the refugees themselves in the decisionmaking and implementation process, underlies this success. The experience of Istanbul can serve as a positive example and offer motivation for forthcoming policies toward Syrians across Turkey and elsewhere. This article is adapted from the report, Urban Refugees from “Detachment” to “Harmonization”: Syrian Refugees and Process Management of Municipalities: The Case of Istanbul (2017), by M. Murat Erdoğan. The author thanks Dr. Onur Unutulmaz from Ankara Social Sciences University for his contribution. Erdoğan, M. Murat. 2017. Urban Refugees from “Detachment” to “Harmonization”: Syrian Refugees and Process Management of Municipalities: The Case of Istanbul. Istanbul: Marmara Municipalities Union. Available online. Erdoğan, M. Murat and Ayhan Kaya, eds. 2015. Türkiye’nin Göç Tarihi: 14. Yüzyıldan 21. Yüzyıla Türkiye’ye Göçler (Migration History of Turkey: Migration to Turkey from 14th to 21st Century). Istanbul: Istanbul Bilgi University Press. Erdoğan, M. Murat and Can Ünver. 2015. Perspectives, Expectations and Suggestions of the Turkish Business Sector on Syrians in Turkey. Ankara: Turkish Confederation of Employer Associations (TISK). Available online. İçduygu, Ahmet and Kemal Kirişçi, eds. 2009. Land of Diverse Migrations: Challenges of Emigration and Migration in Turkey. Istanbul: Istanbul Bilgi University Press. Istanbul Metropolitan Municipality (IMM) Directorate of Urban Planning. 2014. Measurement of the Quality of Urban Life in Istanbul. Istanbul: IMM. Marmara Municipalities Union. 2015. Report of the Workshop “The Role of Municipalities in Service to Urban Refugees.” Istanbul: Marmara Municipalities Union. Turkey Ministry of Interior Directorate General of Migration Management (DGMM). 2017. International Protection Statistics. Updated June 6, 2017. Available online (in Turkish). ---. 2017. Temporary Protection Statistics. Updated August 8, 2017. Available online. UN High Commissioner for Refugees (UNHCR). N.d. Syria Regional Refugee Response. Accessed July 16, 2017. Available online. ---. N.d. Urban Refugees. Accessed July 18, 2017. Available online. M. Murat Erdoğan is Associate Professor of Political Science and Public Administration at Hacettepe University in Ankara, and Director of the University’s Migration and Politics Research Center (HUGO). More than 18,000 Syrian refugees have been resettled in the United States since civil war broke out in Syria in 2011. Nearly half of Syrian refugees are under age 14, and this population is more dispersed geographically across the country than the overall Syrian immigrant population. This article offers a demographic profile of Syrian refugees, including age, gender, language, and religion, as well as top state and city destinations.